Preheat oven to 350. 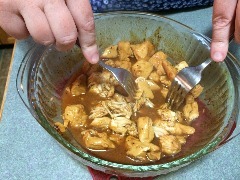 Cut chicken into small pieces and cover with half the bottle of Mama Lou's Barbeque sauce, salt and pepper. Cover with foil and bake for 1 hour, or until fork tender. 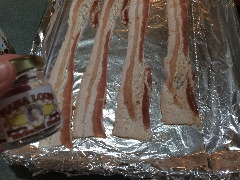 One a foil lined cookie sheet place 4 pieces of bacon and sprinkle with 1 teaspoon Mama Lou's Barbeque Spice mix. Place in oven with chicken for the last 15 minutes or until bacon is crispy. Once chicken is tender shred with forks. Mix flour with 1/2 tablespoon Mama Lou's Barbeque Spice mix, salt and pepper. In a separate bowl mix milk with egg. 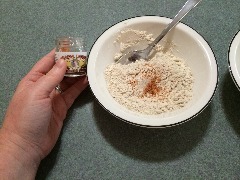 In a third bowl combine bread crumbs with 1 tablespoon Mama Lou's Barbeque Spice mix, salt and pepper. 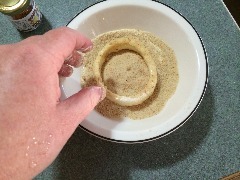 Slice onion into rings and separate. 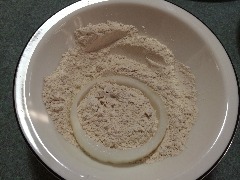 Place onion rings one at a time in flour mixture, making sure to throughly coat with flour. Then dipping it in the egg and milk mixture. Note: If you want onion rings with a thick breading repeat this process again. Over medium heat, warm 3/4 cup of a mild cooking oil (I use grapeseed oil). 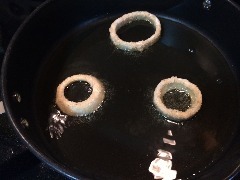 Cook onion rings about 2 minutes per side or until golden brown. Slice bread and paint with melted butter. 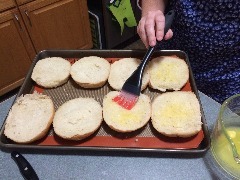 Toast on broil for about 2 minutes or until bread has toasted. Slice some grass fed cheddar cheese to top the burgers. 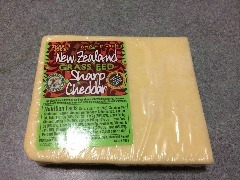 Note: Here is some info on why grass fed cows make healthier cheese. 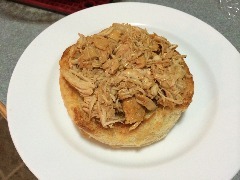 Place shredded chicken on the bottom of the bun. (if desired you can spread a little Mama Lou's Barbeque Sauce on the bottom for extra tang). 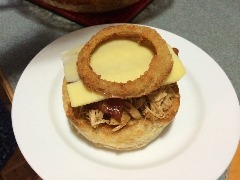 Top with BBQ Bacon, sliced cheddar and onion ring. 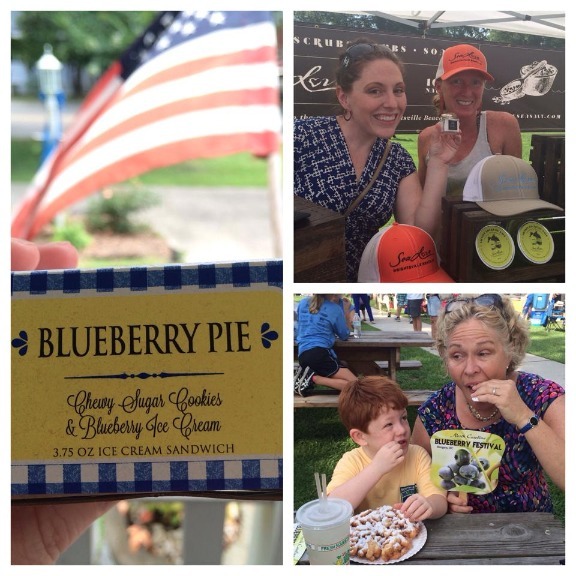 This past weekend was the 12th Annual Blueberry Festival in Burgaw, NC (my lovely mama's hometown). My grandparents live a block away from the historic downtown (which has been a post apolyptic town in the show Revolution, the town trapped in Under the Dome as the real Chester's Mill, and much more). Local vendors pack the courthouse square and besides the absolute sweltering heat, its a delightful day. I especially loved meeting the folks behind Sunny Soap, Nye's Cream Ice Cream Sandwichs, Sea Love Sea Salt and Mama Lou's Barbecue. As we were walking from booth to booth my mother stopped and said "Wait, I know that woman, she was my friends grandmother." Low and behold my mother knows the family behind Mama Lou's and once I had the opportunity to taste the sauce, I was hooked. (To find out more about Mama Lou's or to order your own bottle click here). 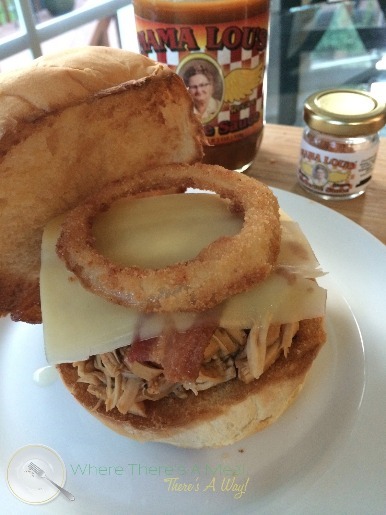 So in an effort to keep the Father's Day festivities going all week, I decided to make my husband, the barbecue lover, the ultimate BBQ sandwich. The verdict? One of his favorites! It was so moist and tender and tangy. Add the extra crispy bacon, and the spicy crunch of the onion ring, then finish it off with the cool creamy bite of cheddar. I mean what more could you want?! Want a barbecue sandwich that tastes like something your grandmother would make (Or your mom's friends grandmothers) well, where there's a meal, there's a way! 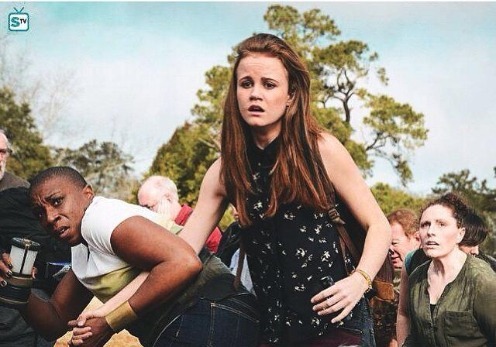 Look for me (and my bulging neck muscles) and the town of Burgaw this Thursday night on the season premiere of Under the Dome!